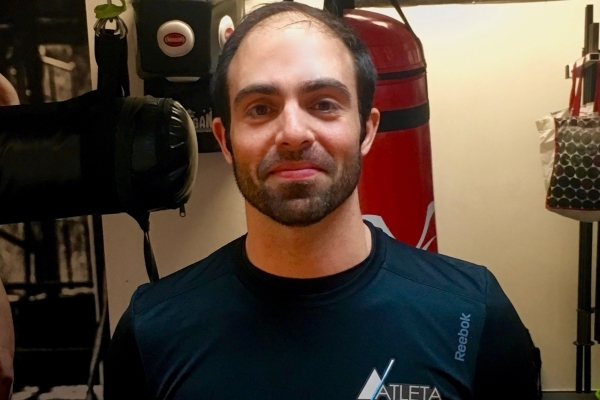 Meet Ivo Cortes, over the last 6 months he has made himself a valuable member of the ATLETA team in the heart of Sydney’s CBD. His knowledge, experience and passion for helping people achieve their goals has been nothing short of inspirational. We sat down with Ivo to discuss how he got to where he is today and what makes him tick. When did you first start working in Exercise and Sport Science? I started my Degree back in 2000, then 2002 I did my first placement in a clinic gym from my University, there I had my first experience with older adults and rehabilitation as part of an elderly physiotherapy program. After 2.5 years I change to Catholic University of Goias to complete my studies, which is considered one of the best private University in Brazil. In 2004, while I was still studying I did placement in a Fitness Centre called, Flex Fitness Centre. There I had my first formal job in 2005, after I graduated. I was a part time job as employee and also opened my own business as Exercise Scientist. At the same time I also started to study a Graduate Diploma in Resistance Training to improve my skills to work as an Exercise Physiologist in Brazil. In 2007, I concluded my Graduate Diploma and started to work more consistently with chronic conditions clientele and also with clients seeking to improve fitness and sports specific performance. I was lucky enough to coach Leonardo Gomes Santos, from the Brazilian Taekwondo Team, he received a bronze medal in the Pan American Championships in 2008. How long have you lived and worked in Australia now? I came to Australia to learn english in February of 2010. To improve my professional specific english skills I enrolled in Cert III, IV and Diploma of Fitness this would also prepare me to do a Masters Degree in Exercise Physiology. I started to work in a gym in Feb 2012, at Fitness First Market St, eventually setting up my own business as a Personal trainer there. Following that, I completed a course of Diploma of Fitness at ACSF and it allowed to work with clients with moderate conditions(in Australia) as well as personal training clientele. It was at that course that I first got the attention of Rob Lyon from ATLETA, he was my teacher and the head teacher of the course at that time. Rob explained to me that I needed to get my qualification from Brazil accredited in Australia with Exercise & Sport Science Australia (ESSA) in order to join the ATLETA Team, it’s taken me 8 years, but I am really happy to be fully accredited as an Exercise Physiologist here and work with ATLETA. What is your biggest client success story? It’s hard to say as I believe every single achievement that improvs a clients life is a big success story to me, however, the success I had with my second ever client in Brazil is hard to ignore. When we first started she had been diagnosed with osteoporosis, after 2.5 years of working with me we were able to reverse the condition to osteopenia, which was significant for bone health and quality of life! We trained a total of 5 years together, the same time that I spent formally working in a Brazil, from the beginning of 2005 till the end of 2009 and only stopped training together when I moved to Australia. This was such a big success for me as it showed me how much of a difference I could make in peoples life. In Australia I was really proud in a client who has a condition called facioscapulohumeral dystrophy – FSHD, which is a degenerative muscle disease. When we first started working together he was not able to do a single body weight squat and nor a solo sit up. After a multidisciplinary approached working closely with his doctor and following my exercise program, we were able to increase his strength considerably and he was able to do 7 body weight squats and 6 Sit ups on his own in only 8 weeks training. He could now do more and improve his quality of life and overall fitness. Why did you want to join the ATLETA team? As I mentioned before I already knew a fair bit about ATLETA through Rob and I was interested in working with such a high-profile professional. Then, after a meeting with Rob and Neil I realised that we shared similar principles and working philosophy. I would be able to do exercise rehabilitation(especially musculoskeletal), posture, biomechanics analysis and core and functional training, but I also enjoy helping people achieve their fitness potential and goal body composition(ie weight loss). ATLETA seemed like a great environment for that. I like a challenge so ideally someone who has some sort of condition such as, knee issues, low back pain (LBP), shoulder complications and/or any condition specially from a musculoskeletal nature. This client is seeking improvement on their physical functionality for the ADLs, improve his/her wellbeing to achieve a better quality of life. It’s great to have motivated clients that just need some guidance and I feel Sydney is full of high achievers who have a preexisting injury or condition that need my help to optimise their health and performance. What’s your biggest personal achievement in sport and training? In sports, winning a double gold medal in the adult division (76kg and Open Weight) in Brazilian Jiu Jitsu at the blue belt level in the state of Mato Grosso in Brazil, in 2006. When it comes to training, I was able to fully rehabilitate my shoulders Acromio-Clavicular(AC) Joint surgery in 2002. It’s ongoing but my shoulder is completely functional and I focussed on it so much that it’s probably even better than the other non surgery shoulder. If you could give one piece of advice to everyone out there to make them healthier & happier, what would it be? Find a way to feel pleasure exercising and have exercise as a way of feeling pleasure in life. Listen to your body, you don’t have to push hard all the time, learn how to go hard when the time is right or take it easy when your body tells you to. Learn what you can about your own body and if you are able to afford a good professional then do it, because it is surely not an expense but rather a very solid investment which will reflect in basically everything you do. Remember you can’t simply leave your body at home and go anywhere or do anything without it, right?! Your body is your only vessel in this life. If you could change one thing about the health and fitness industry in Australia what would it be, how would you improve it? In Brazil, in order to became a personal trainer an individual needs to complete a 4 years Bachelor Degree in Physical Education and/or Exercise and Sport Science. It means that if you are paying for professional advice you get someone with the appropriate education. I think this would raise the bar and make the industry become stronger and more reliable from a professional and scientific standpoint. Leading to less shirt off flexing type trainers who push a be like me product or attitude and more scientifically proven programming and delivery that is best for you and your specific goals and needs. Ivo is an amazing trainer, if you enjoyed this insight into his life and professional experience please don’t hesitate to contact us and book in with him to achieve your health and performance goals.